EURO-IVET – Transnational Meeting in Dublin! 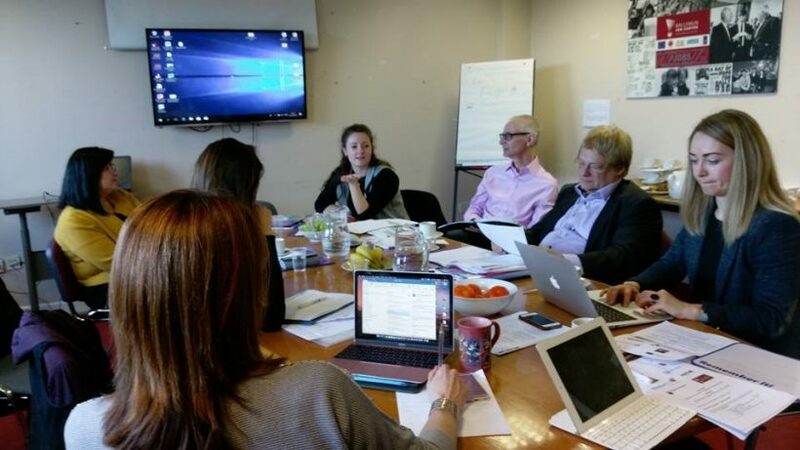 Eurocircle Marseille was in Dublin, on February 1st and 2nd 2018 for the transanational meeting hosted by Irish partner Ballymun Job Centre of the project Euro-IVET. Partners 15billion-ebp, Rinova London, MetropolisNet, Folkuniversitetet, Ballymun Job Centre and Eurocircle Marseille worked the current and upcoming Intellectual production. General feedbacks from the testing in each country were shared. Partners were asked to comment on the structure of the workshops, content, and quality, role of the participants and their evaluation of this innovative training they were attending. Some changes were agreed in order to improve the curriculum and enable partner to deliver this training on a long term. The partner from Sweden, Folkuniversitetet, introduced the online platform and how the e-learning will be attended; the role of the trainers, moderators and some guidelines on how participants should use it. The second day was a focus on the next productions to implement: the assessment, validation and certification procedure; the creation of the EURO IVET network of practitioners and the policy recommendations guidelines. These 3 outputs along with the completion of the curriculum and the running of the platform will be the core activities for the partners until June 2018 when the next meeting will take place in London. A final conference will be organised in order to present the results and promote them.